tutorials - Business-Cards and Graphic-Design. Designing a business card is one of the first things you learn in graphic design and print. 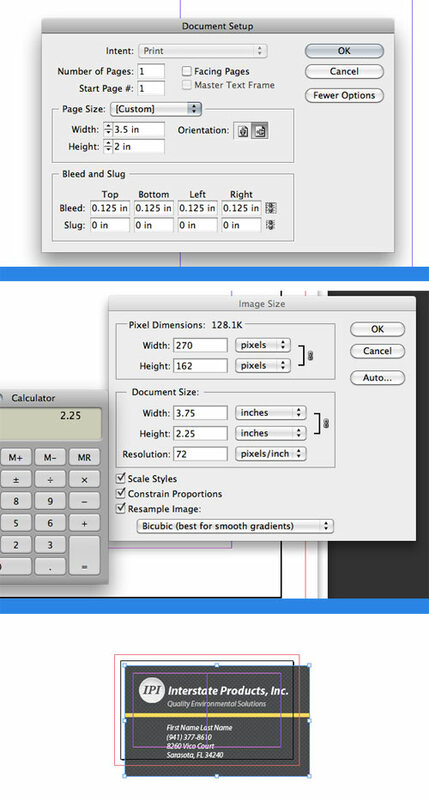 First create an Indesign document @ 3.5" X 2" with the addition of .125" bleed on all sides. Next, create a Photoshop document @ 3.75" X 2.25" to accommodate the bleed. Set up your solid color areas, and your logo. You can set up all the text for positioning but remember that it's best to have text in vector, rather than bitmap, especially at a small size. Also, keep all fonts at least 9 pixies and knock out any light colors on dark background. Now place the .psd into the .indd. This is where I "strace" the smaller text that is currently in the Photoshop document. Making sure all the colors are correct, whether if your using CMYK or SPOT. Make sure that you have kept all important graphic and text elements within the "live area" (nothing going past the crop marks). You can go way over the bleed mark since InDesign will crop before export. Now, just export your business card in pdf format, (I like to flatten/create outlines for the fonts in case I don't package the bundle or if the printer doesn't have the correct fonts installed. Newer version of Acrobat embed the fonts pretty well, but I'm used to outlining the fonts (in a different page or file in order to be editable later) before going to press. That's it. You can easily set up a business card and upload it to your local printer or a national online print center and have your cards within a few days. 250 is usually the minimum count you can order and will last you longer that you think.